Immediate Loading Implants, We are the dental implant Clinic Bangkok and dental implants Thailand. 2. installing the implant : The step is installing dental implant and normally done in a single session. 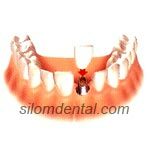 Temporary crown is attached so you can eat and function normally, while waiting for the permanent crown. A week or so after the first visit, the permanent crown can be fixed to the implant. Your new tooth should blend in perfectly with the others. No-one else will even notice it's not real. 2. installing the implants : This is normally done in a single session. Temporary teeth are attached so you can eat and function normally, while waiting for the permanent bridge. Implants usually need a month or two to integrate with the jaw. Once they've 'taken', the permanent bridge can be fixed to the implants. Your new teeth should look and feel just like your natural ones. People will find it hard to tell the difference. 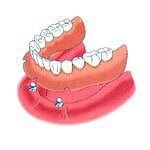 2. installing the implants : This step is installing dental implants to secure the overdenture. Only two implants are needed. The overdenture is securely fixed on top of the implants. They will be removable for cleaning and oral hygiene. At last, there's no need to worry about a slipping, sliding or clicking denture. You're free to enjoy life. People will find it hard to tell the difference.